Brian Hawley's 'Luxury Liner Row' offers a diverse selection of ocean liner memorabilia at prices to suit all pockets. Over the last 5 years, he has built up a solid reputation for reliability and honesty and I'm proud to be classed as a "client". His support for the restoration of SS Nomadic is much appreciated and I look forward to a time in the future when we can enjoy a drink or two onboard the last White Star Line vessel in the world. No doubt we'll be discussing a purchase from his superb offerings! Never had another one like this! 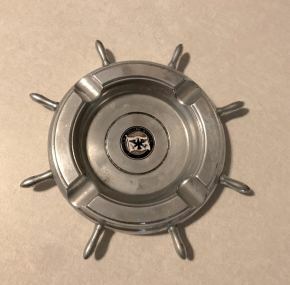 An ashtray purchased on the maiden voyage by a crew member. It was sold directly to me by his daughter. Souvenirs for the “Big Ship” rarely turn up, but this one is a must for the coffee table of any ss United States aficionado. Made from a solid block of milled aluminum, it is a beautiful, high-quality piece. No issues with the enamel. Measures about 6″ across.